When I stepped inside a little charity shop in Old Ballard for the first time, I didn't have a lot of time. I was early for a job interview, but couldn't resist spending my 10-minutes-to-kill in the cozy confines of the R-Shoppe. Turned out it was time well spent, especially when I spied this unique art glass necklace. It reminded me of something Iris Apfel might wear. Spinster chic is what I called it; I picked it up and made my purchase. Looking at snapshots of me modelling the necklace, I can clearly see the Advanced Style influence- the mad mix of floral and leopard is very akin to the wise style of Advanced Style. For me, leopard print is officially a "blogger's neutral," as in it goes with EVERYTHING, and it feels nearly necessary to "doll up" for day-to-day activities. The exquisite statement piece was an effortless fit into the eclectic elements of the outfit. As I ooohed-and-ahhhed over the silver fox's leopard bow above, you'll notice that I was wearing a coordinating leopard cardigan. And my floral shorts blended right in with artist Beatrix Ost's riotous floral jacket. Is this a case of Life imitating Art? Or is it possible that ART IS LIFE? The art glass necklace is now available in my ETSY shop. I'm offering free shipping in the U.S. when you use code BUDZFREESHIP. I now can ship worldwide. I'm working of getting more items in the shop- so in advance: THANK YOU for your support! You can view the gorgeous art glass piece by clicking HERE. i adore this dress and the mixture of patterns!! you are always so unique! I love the necklace and I totally agree on leopard print, it should be a neutral print for every closet! I adore your outfit it's totally on my street! 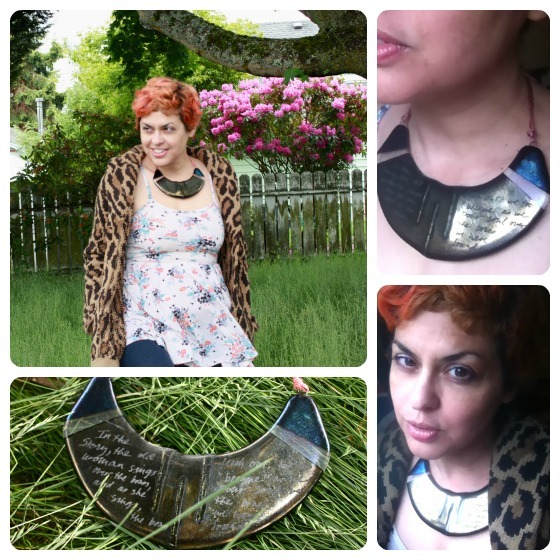 That necklace is stunning, I just popped over to your Etsy shop and read the inscription. Pouring soul over the bones - I like that. 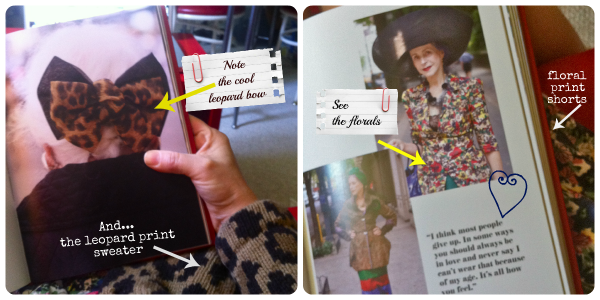 Leopard print=bloggers' neatral - I like that too! Your animal print/floral mix is aslways a delight. I love this print combination, and that necklace is gorgeous! I love it. Definitely checking your etsy shop, too. Very cool find, that necklace! I love the poem on it. And yes, leopard print is a NEUTRAL, dammit! What a cool necklace, Bella! I love the look of it and you can get so much wear from a piece like this...you look beautiful! That necklace is absolutely stunning, I love it to bits. All the very best for expanding your Etsy shop! For some reason we always manage to find extraordinary items in the least expected place - that is a marvelous necklace. AND I love Advanced Style ! i saw he wrote a book and I hope to be able to get my little hands on it in the near future. COuld not agree more - leopard is a neutral. Gorgeous necklace. I adore your combinations and style. The photo in the lower right is movie star material. The expression on your face, deep eyes with leopard print and the gorgeous art glass necklace should be on a magazine cover. I do believe that art is life, and you are living it in technicolor. I love your plaque necklace amor! You look good in florals/leopard combo.Your face pics are always so strong. Leopard rules! I wear it everyday without noticing it. It is become more of a ritual for me. The necklace is divine. Such a wonderful find, really it is! Life is Art and Art is Life (at least for some of us). Leopard has never worked for me, but it looks gorgeous on you, and I adore that necklace (and will pop over to your etsy shop to look but I'm sure it's sold already). Hope the interview went well! The glimpses of what you're wearing as you read is so good! Love the poem on the necklace. I love your sense of style – how do you make it work so well for you? I love to add something quirky to my outfit every day, but have never been brave enough to wear any kind of animal print. I’ll be browsing through your etsy store to see what great pieces I can snap up!